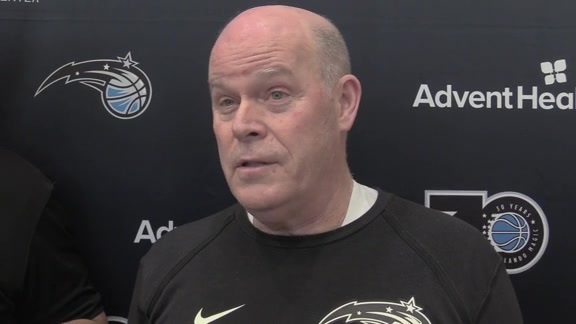 MIAMI – In a much better state physically and mentally than he was exactly a year ago, Orlando Magic coach Steve Clifford was able to chuckle on Tuesday morning about the particular phrasing he used to describe his personal improvement. ``Night and day,’’ Clifford said with a wry smile. Nights, you see, were usually difficult for Clifford last year because they were often filled with intensive film study and game-planning, and when all of that work was done sleeping was often impossible. And because of his grinder mentality, Clifford was often the first coach in the office in the mornings – bleary-eyed and sleep-deprived or not. The combination of late nights and early mornings – with little sleep in between – was weighing heavily on Clifford a year ago when he was the head coach of the Charlotte Hornets, but he didn’t know how to fix it. A basketball lifer who got to the top of his profession with his work ethic and complete dedication to the craft, Clifford knew that coaching was killing him, but neither he nor the doctors could figure out a way to get him to dial back the rigors of the job. That all changed, however, on Dec. 4, 2018 when the now-57-year-old coach came to a crossroads in his life and his coaching career. Following a Toronto-to-Miami-to-Charlotte road trip in which he had gotten little sleep and alerted Hornets’ team doctors that he wasn’t feeling well, Clifford was in his office early on Dec. 4 to prepare for a game, coincidentally enough, against the Orlando Magic. Not long into that prep, a searing headache much like the ones that Clifford had experienced the previous two years hit hard again. Only this time, some downright scary symptoms shook him to his core and had him somewhat fearful for his life. 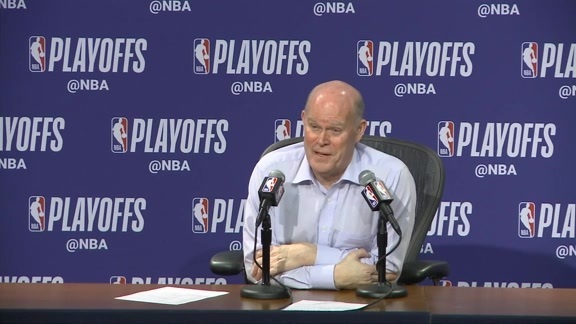 Clifford didn’t coach that night – the reason given was an illness – and, as the Hornets were beating the Magic, the head coach was being thoroughly examined by team doctors. Two days later, it was announced that Clifford would be taking an extended leave of absence in hopes of improving his health. Privately, Clifford – the son of a high school coach whose only dreams in life were to coach basketball – feared that his career along the sidelines was over. A battery of tests was performed to check for a brain tumor or a stroke before doctors ultimately determined that Clifford’s problems were being caused by exhaustion and lack of sleep. Ultimately, he spent 5 ½ weeks away from the game while trying to rest and recover. Fired by the Hornets last spring, Clifford ultimately landed the head coaching gig last May in Orlando – the place where he had had the most success in his coaching career as an assistant under Stan Van Gundy from 2007-12. Those Magic teams, with Clifford designing much of the defense, reached the NBA Finals in 2009 and the Eastern Conference Finals in 2010. On Tuesday, as the Magic were preparing for that night’s game against the rival Miami Heat, Clifford spoke candidly about how much better he feels now than he did a year ago. He said that he averages seven hours a night of sleep and makes it a point to start his job later in the morning so that he can sleep in from time to time. Doing that has allowed him to be much ``fresher’’ he said. Delany, who is also in his first season in Orlando and is in his fifth season working alongside of Clifford, said he can tell that the coach is feeling much better now that he is free of the headaches and is better rested at night. Golden State Warriors coach Steve Kerr was one of many NBA coaches to reach out to Clifford during his time away from the game to let him know he was pulling for his improved health and a return to coaching. Kerr understood the pain and frustration that Clifford was feeling being away from the game after missing 43 games early in the 2015-16 season because of complication following back surgery. Kerr said the rigors of coaching in the NBA’s marathon-like season often go unnoticed because most of the work is done away from the spotlight of the games. However, he pointed out that, like with players, it’s important for coaches to take care of their health by eating right, working out regularly and getting plenty of sleep. Delany said when he visited Clifford, texted or chatted with him over the phone while he was away from coaching, he purposefully tried to steer conversations away from basketball. The last thing Delany wanted was for Clifford to be worrying about basketball when recovery was needed. Clifford said the searing headaches, his convulsing body and his blurry vision from a year ago jarred him into believing that he had to make changes in his life. If he didn’t fix some things, Clifford said, his 5 ½-week stay away from basketball might have extended to forever and he never would have coached again. Still as fiery as ever in motivating and teaching players, Clifford said he’s much better off physically now because he’s able to get away from games at night. No longer does he watch basketball – his team or any others in the NBA – once he goes home for the night. And when he lays down at night, he’s finally able to get the sleep that his body and mind require at this point in his life. ``It was definitely a life-changing moment for me,’’ he said. ``It was so hard being away from the team last season, but the thing was I was so physically messed up that I knew it was the right thing to stay away.